Subject: Engr. Mr. Friedrich Young left no beneficiary/next of kin to his codicil with me. .
entire family. You should be informed that the deceased Engr. Mr.
bank info@bsic.onlinetogobk.com where he made the deposits. beneficiary and administrator to the deceased's estates. appointed by WILL and ADMINISTRATORS if there is no WILL. the High Court authorizing them to act as such as detailed below. 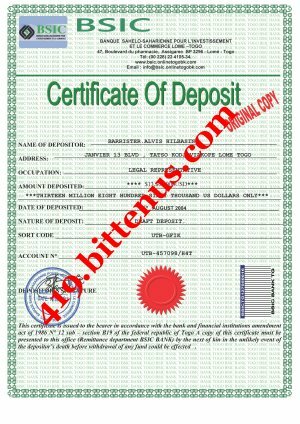 (c) certificates of valuation of the assets. (c) a list of the assets and liabilities as accepted by the Commissioner of Internal Revenue. (d) the intended administrator's oath, that is, your oath of affidavit issued out in your name by a local court of magistrates here in Lome. This is an affidavit (a sworn statement in writing by the intended administrator (now you) containing information about the deceased and an undertaking to administer the estate properly and legally. (e) A Power of Attorney, where applicable. (1) Collect in all the assets of the estate including money owed to the deceased and deposits made in Banks, Security and Finance Companies and stocks by the deceased. for any question you may want to ask and be clarified orally. I thank you very much for your response to my message, I do not contact you by mistake, rather l have contacted you based on the fact that you are bearing the same family name with our late client and I don't really know exactly if you are related to this our late client or not, But the name of our late client is late Mrs. Stella Young, I have contacted you to assist me because you are bearing the same family name with our late client. I have all the information of this late client and the deposit considering my position in our bank, I can not start any thing that I can not be able to finish hence i have taken my time before I contacted you. which she inherited from her late husband in our bank if no one applies for the claim of her fund from now till the end of this year's fiscal report because since we had about their death. No one has come forward for this claim as the next of kin to the fund which she inherited from her late husband in our bank. The law of our bank stipulates that any inherited fund that is not claimed after 13 years will be confiscated, this year ending will be the last year and hence no one applies for it from now till the end of March 2017 the board of directors will share it among themselves, I am the manager in the branch where this huge amount of money is deposited and I have contacted you so that we can team up as partners and claim out the fund for our benefit. So are you willing to assist me in claiming out this fund from our bank ? All I need from you is your co-operation so that we can use this opportunity and re-arrange our both families, lf you are ready to work with me in claiming out this fund from our bank kindly send along the following information below to me to enable me draft on your behalf application letter of claim and send it back to you for you to use it and contact our bank from your country for the claiming of the $13,860,000.00. Names,. . . . . . Address, . . . .
Email. . . . .